Penny Fielding is Grierson Professor of English Literature at the University of Edinburgh, and a general editor of The New Edinburgh Edition of The Works of Robert Louis Stevenson. In 1879, Robert Louis Stevenson made the long and difficult journey by sea and rail from Greenock to Monterey, California to reunite with Frances van de Grift Osbourne, whom he had met three years earlier in France. The following year they married in San Francisco and after some months together in California they returned to Scotland. The marriage came with its own dangers. The social life of R. L. Stevenson (Louis, as his family and friends called him) revolved particularly round a group of men who acted as friends, literary agents, accountants, editors, advisors and mentors. 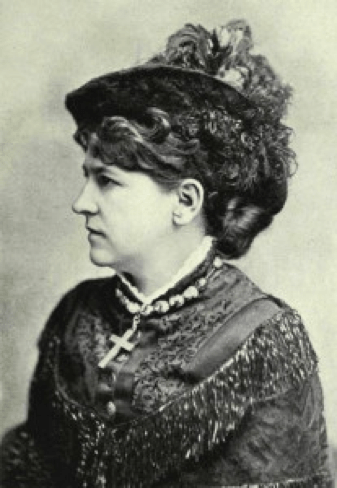 Although Louis’s family welcomed her, Fanny Stevenson was not popular among many of her husband’s friends, who distrusted her for a host of reasons. She was American, ten years older than him, a divorced woman with two children, and an independent, out-spoken character who had lead a tough life. She had a strong temper and she knew how to shoot a gun. Fanny was not thought of by Louis’s friends as a partner in his writing. But in 1885, a volume was published bearing the title page: ‘More New Arabian Nights: The Dynamiter by Robert Louis Stevenson and Fanny van de Grift Stevenson’ (the illustration above shows the simultaneously published paperback edition). The story of The Dynamiter allows us to understand Fanny Stevenson as an author herself in a collaboration that was dangerous not only because Louis was happy to share authorship, but also because of the way the novel challenges the traditional roles of gender in adventure fiction. Louis had already published a novel called New Arabian Nights—a compendium of tales of intrigue set in London—and the new volume has the same series title and narrative form. But Fanny invents something new. First, it is her idea to ground the story in the modern political present. There had been a spate of bombings by Irish nationalists in London and other British cities in the early 1880s, and although most of them had been ineffectual they were the subject of great anxiety in the press. Fanny’s idea is a more sophisticated one than the blustering articles in the newspapers. She decides to satirise the bombings through absurdity and to create was what is probably the earliest comedic novel about terrorism. The Dynamiter is a complex, kaleidoscopic novel. It tells the story of an incompetent group of terrorists (a rather ambiguous collection of Fenians and Anarchists) as they attempt to explode bombs in London. The brains behind this fiendish plot is Clara Luxmore, a resourceful and imaginative young woman who operates under two cover stories. Entering unawares into this secret world are three male friends down on their financial luck. Each of them separately runs into Clara and she takes advantage of their naivety to get them to transport money and material around London and up to Glasgow. Clara invents different characters to recruit the unwitting boys as she tells them the stories of these women’s escapes from danger. In her later account of the composition of The Dynamiter, Fanny explained that it was these stories that formed her particular contribution to the novel. In one she is a Mormon wife fleeing an oppressive marriage in Utah, in another she is a Cuban slave who has made it to Britain and freedom. As the series title New Arabian Nights reminds us, she is a modern-day Scheherazade, spinning out her stories to achieve her own ends. (There is another note of danger here: the original Scheherazade told her husband stories to prevent him from executing her). The characters Clara assumes are women who have been threatened with extreme violence, but she transforms their powerlessness into the resourceful Clara’s story-telling skills. For both Clara and Fanny, storytelling is an assertion of female agency. The female narrators have real, active power in the world. And they have a literary resonance as well that gives a public voice to marginalised groups. Slave narratives and melodramatic Mormon stories of women trapped in polygamous marriages were two popular mid-nineteenth century genres that influence the telling of Clara’s tales. The great American novelist Henry James, who loved to create nuanced female characters, commented that his friend Robert Louis Stevenson wrote mainly books without women in them. This is clearly an exaggeration—Stevenson did write novels and stories with strong female characters. But women are rarely cast in the mould of the figure that he is famous for—the adventure hero. Yet in Louis’s collaboration with Fanny, women take the active, lead roles. The women in the inset tales are on their own and escaping their oppressors. Clara and her mother, another strong woman who organises things her own way, contrast with the well-meaning but ineffectual trio of Challoner, Somerset and Desborough (they are quite hard to tell apart) who blunder through the novel unaware of the uses the Luxmore women are putting them to. The two male members of the dynamite cell spend more time making empty speeches than taking action and one of them ends up blown up by his own bomb. Fanny’s dynamic influence in The Dynamiter was not recognised for a long time. Contemporary reviews of the novel are positive about it as a whole. The influential Saturday Review (May 16, 1885) praised Clara’s stories as ‘simply admirable’ and classed them as ‘a couple of romantic stories which are equal, if not superior, to anything Mr. Stevenson has ever done.’ The Saturday reviewer does not make a distinction between the Stevensons as authors and most reviews simply assume that the novel had joint-authorship without commenting on it. Fanny’s account of their different contributions was to come after her husband’s death in 1894. More recently, we have come to recognise the distinctive energies Fanny brought to the novel. The final account of exactly who wrote what and when is something we cannot and need not decide. But we can look for the traces of Fanny’s hand, not only in her introduction of resourceful women into the narrative, but also in the writing style of an author who also wrote short stories under her own name alone. Although it is impossible to be conclusive, a stylometric study of the novel by Anouk Lang and her postgraduate students at the University of Edinburgh has analysed linguistic distribution through a computer program. The results suggest that Fanny’s distinctive style can be detected in the stories she said that she had composed originally, and that the finished novel, a product of both collaborators, mingles their writing modes. The Dynamiter is a hugely inventive and brilliant book, at once a political thriller, a blackly comic satire, and a female adventure. Conceived by both Stevensons working together, it is a tribute to the volatile, inventive and intense partnership of their lives together. Penny Fielding’s edition of The Dynamiter in the New Edinburgh Edition of the Works of Robert Louis Stevenson, with Fanny Stevenson’s short stories edited by Lena Wänggren, will be published in 2018. [i] Preface to More New Arabian Nights: The Dynamiter, Skerryvore Edition (London, 1924), p.xii. [ii] The Letters of Robert Louis Stevenson, ed. by Bradford A. Booth and Ernest Mehew (New Haven, 1995), vol.5, p.71-2. [iii] Nellie van de Grift Sanchez, The Life of Mrs. Robert Louis Stevenson (London, 1920), p.118. [iv] Frank McLynn, Robert Louis Stevenson: A Biography (London, 1993), p.235.